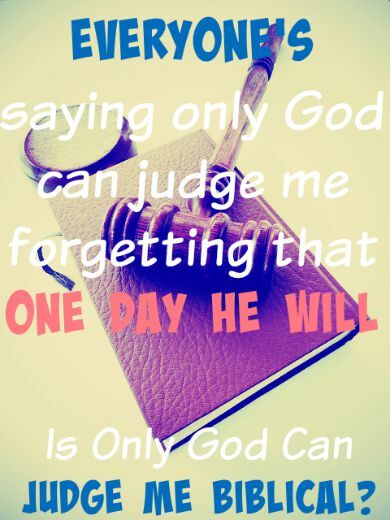 What does only God can judge me mean? We all have heard this statement at some point in our lives, but is this statement biblical? The plain answer is no. This is actually a Tupac Shakur song. When people say this, they are saying you are a human and you have no right to judge me. Many people who don’t want to be held accountable for their deliberate sins use this excuse. Yes it is true the Lord will judge you, but God’s people will judge you as well. I will admit there are indeed Christians who have critical hearts and literally search for something wrong with you so they can judge and no believer should act like this. But the truth is the Bible says not to judge hypocritically and off of appearance. Throughout our lives we are judged. For example, we are judged at school, when getting a drivers license, and at work, but it’s never a problem. It’s only a problem when it has to do with Christianity. How are we to stay away from bad friends if we can’t judge? How are we to save others from their sins? When Christians try to correct rebellious people we do so out of love and we do it humbly, gently, and kindly not trying to act like we are better than the person, but sincerely trying to help. You don’t know what you’re saying. The truth is you wouldn’t want God to judge you. God is a consuming fire. When He judges the wicked, He throws them in Hell for eternity. There will be no escaping the torment. Jesus didn’t die so you can spit on His grace and mock Him by your actions. Do you not care about the great price that Jesus paid for you soul. Repent of your sins. Put your trust in Christ alone for salvation. These Scriptures that many people take out of context are talking about hypocritical judging. How can you judge someone when you’re sinning just as much or even worse than they are? Take the log out of your eye before you try to correct others. Matthew 7:3-5 “And why worry about a speck in your friend’s eye when you have a log in your own? How can you think of saying to your friend, ‘Let me help you get rid of that speck in your eye,’ when you can’t see past the log in your own eye? Hypocrite! First get rid of the log in your own eye; then you will see well enough to deal with the speck in your friend’s eye. The Bible teaches us to judge correctly and not off of appearance. Leviticus 19:15 “‘Do not pervert justice; do not show partiality to the poor or favoritism to the great, but judge your neighbor fairly. Scripture teaches us to bring people who are living in rebellion back on the right path. James 5:20 Realize that whoever brings a sinner back from the error of his ways will save him from death, and many sins will be forgiven. 1 Corinthians 6:2-3 Or do you not know that the saints will judge the world? And if the world is to be judged by you, are you not competent to settle trivial suits? Do you not know that we will judge angels? Why not ordinary matters! Galatians 6:1 Brothers and sisters, if a person gets trapped by wrongdoing, those of you who are spiritual should help that person turn away from doing wrong. Do it in a gentle way. At the same time watch yourself so that you also are not tempted. Matthew 18:15-17 “If your brother sins against you, go and rebuke him in private. If he listens to you, you have won your brother. But if he won’t listen, take one or two more with you, so that by the testimony of two or three witnesses every fact may be established. If he pays no attention to them, tell the church. But if he doesn’t pay attention even to the church, let him be like an unbeliever and a tax collector to you. How are we to watch out for false teachers if we can’t judge? Matthew 7:15-16 Beware of false prophets who come to you in sheep’s clothing but inwardly are savage wolves. You will know them by their fruit. Grapes aren’t gathered from thorns, or figs from thistles, are they? Ezekiel 3:18-19 So when I say to a wicked person, ‘You’re about to die,’ if you don’t warn or instruct that wicked person that his behavior is wicked so he can live, that wicked person will die in his sin, but I’ll hold you responsible for his death. If you warn the wicked person, and he doesn’t repent of his wickedness or of his wicked behavior, he’ll die in his sin, but you will have saved your own life. If you remain rebellious towards His Word you wouldn’t want God to judge you. 2 Thessalonians 1:8 taking vengeance with flaming fire on those who don’t know God and on those who don’t obey the gospel of our Lord Jesus. When using this excuse to justify willful sin goes wrong. 1 John 3:8-10 The one who practices sin is of the devil, because the devil has been sinning from the beginning. For this purpose the Son of God was revealed: to destroy the works of the devil. Everyone who has been fathered by God does not practice sin, because God’s seed resides in him, and thus he is not able to sin, because he has been fathered by God. By this the children of God and the children of the devil are revealed: Everyone who does not practice righteousness—the one who does not love his fellow Christian—is not of God. At the end of the day the Lord will judge. This is best explained by looking at the story of the Exodus from Mitzrayim. We do not mention Pharoah’s name because it says that G_d “hardened his heart” and also turned his mind against the Israelites. Pharaoh was certainly a WICKED man but we know that while he was not RIGHTEOUS, he did act for what he thought was the betterment of HIS PEOPLE. G_d punished the Egyptians on his own terms, judging them not for what they did but in HOW FAR they took their actions. Those with the DARKEST hearts fell slowly like driftwood to the bottom and suffered greatly before perishing. Those with LIGHT in their hearts sank QUICKLY and suffered little as they perished. So as you see, only G_D can judge.